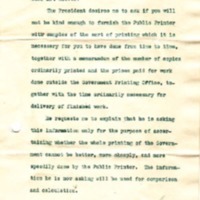 Joseph Tumulty asks Herbert Hoover to furnish the Public Printer with an estimate of additional printing needs beyond what is done by the Government Printing Office to see if it is being done efficiently. The President desires me to ask if you will not be kind enough to furnish the Public Printer with samples of the sort of printing which it is necessary for you to have done from time to time, together with a memorandum of the number of copies ordinarily printed and the prices paid for work done outside the Government Printing Office, together with the time ordinarily necessary for delivery of finished work. He requests me to explain that he is asking this information only for the purpose of ascertaining whether the whole printing of the Government cannot be better, more cheaply, and more speedily done by the Public Printer. The information he is now asking will be used for comparison and calculation. Tumulty, Joseph P. (Joseph Patrick), 1879-1954, “Joseph P. Tumulty to Herbert Hoover,” 1918 June 15, WWP19441, Hoover Institute at Stanford University Collection, Woodrow Wilson Presidential Library & Museum, Staunton, Virginia.